The sound of a piano floats around lightly and moves our hearts but the body of a piano is massive. That’s not a problem as long as the piano stays in the living room and is only played on. 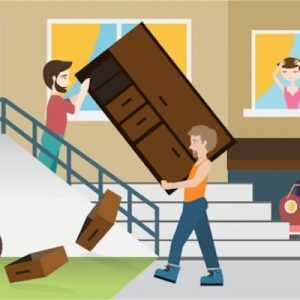 As soon as you have to move it to another apartment, you’ll start tearing out your hair. How on earth are you going to move that jumbo to your new place? We know what you should watch out for if you’re moving a piano. Reality Check: When should You Call a Professional? Do-it-yourself or call a professional? To answer this question, you should first take a better look at your piano. Pianos weight between 170 and 300 kilograms. Is it rather on the heavier side? Is it an older piano that is chunkily built? Or is it valuable? In those cases, it’s worth organizing a professional company to transport the instrument. Then, the instrument will also be covered by insurance. Do you have a grand piano that weighs up to 500 kilograms? 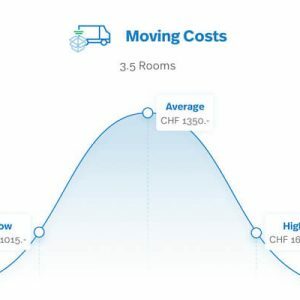 In that case you shouldn’t hesitate to ask a professional moving company for help. 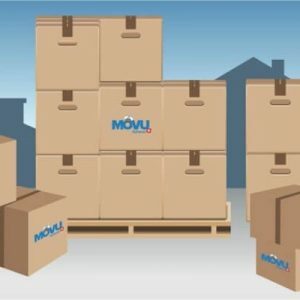 Start a survey at MOVU and you will get 5 offers for the transportation of your big instrument. You have to keep in mind that such an instrument doesn’t allow any transportation damages. If something bad happens because you and your helpers moved the piano the wrong way, the tunes will suffer. Not even the best piano tuner will be able to fix the tone color like the way it was before. Also, think of how far the piano has to be transported. If it’s on the ground floor and the van is near the apartment, then the piano transport will be easier. However, if the instrument has to go through a very narrow staircase, then it’s a job for the professionals. It can happen that the staircase is too narrow to move the piano. In this case, it’s possible to deconstruct the piano into small parts. This should only be done by a specialist. If the piano can’t be taken apart, then you’ll need a crane to get it out from the window. You should also ask a professional if you don’t have enough helpers. Moreover, safety and health are first priority. It doesn’t make sense to transport a piano on your own if you are suffering from back pain, even if it’s mostly cured. You can transport a piano on your own if it’s not the heaviest one. It helps if the transport happens on ground level and if you don’t need to carry it over several floors. Your helpers — at least 3 — should be selected wisely. It’s important that they have some muscles. They should also be calm and cool-headed and shouldn’t want to finish their work as quickly as possible. A piano transport needs to be done unhurriedly and needs good planning. By now you’ll understand why you need at least two or three strong helpers. In the first step, two people are going to lift the piano (with the help of furniture belts), and the third person slips the dolly under the instrument. The fourth person makes sure that the dolly is placed in the middle. Tip: close the keyboard cover and fasten it. In this way, you protect the keys from damage as well as your fingers from getting jammed. Instead of lifting the piano, two helpers can tilt it to the side so that the so-called dog can be placed underneath. Make sure that the side of the piano on the floor is protected with a blanket. When the piano is on the dolly, don’t simply let go. The piano should always be held by two people. Now, it can be carefully rolled to the staircase. 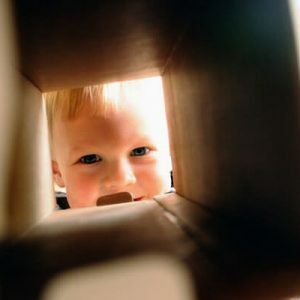 Every obstacle should be removed beforehand, so that nobody will get hurt. As mentioned, moving on the ground level is ideal. Unfortunately, one might not be that lucky, so we’ll have to go through the staircase. The magic word is balance. Balance will make sure that the piano won’t be detuned. With the help of the furniture belts, two people can carefully lift the piano from the dolly. Carry it one stair at the time. Take a small break at each resting place to gather new strength. You overcame the staircase without damaging the piano or your helpers? Good! Once you’ve arrived downstairs, the rest of the process depends on the transportation you’ve organized. 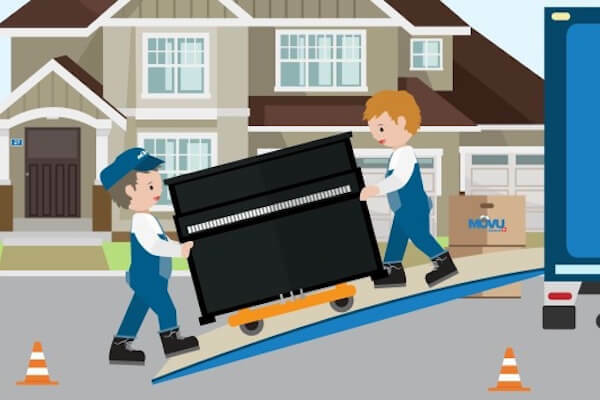 First of all, the piano – as described above – has to be placed on the dolly again and needs to be pushed carefully to the vehicle. The easiest way is to load with a ramp. Lift it carefully from the dolly and place it on the ramp. One person is on the ramp and pulls from above, while two super strong helpers push from below. The one on top gives the directions. Inside the transporter, the backside of the piano should be put against the wall and the piano should be secured properly. You don’t have a vehicle with a ramp? No problem. Here are some tricks on how you can still get the instrument to the desired destination. Does the transporter have a low boot sill? In that case, two people should lift the piano while the third person moves the dolly to the left. Lower the piano and hold it firmly. The right side, now in the air, can be lifted and carefully placed on the loading area. Lift the other side of the dolly and push the piano slowly into the loading area. It’s slightly harder, if the transporter has a higher boot sill. Position the piano as close to the transporter as possible and place the dolly at the back of the piano. Lift the other side of the piano and push it towards the loading area, while the dolly moves with the piano. Once the instrument is on the loading area, it can be pushed inside. A third person should always keep an eye on the piano so that it stays put. Before you move the piano to the new apartment, you should of course strap it tightly. Pad the pressure points with some sheets and covers, so that nothing will be damaged. It’s convenient if the van has some sort of equipment in the inside wall, so that you can secure the piano with the straps. You don’t want it to tilt over during the drive and that all the trouble was for nothing. Our last tip: After the transport, the piano might be out of tune. Before you plan your next living room concert, a specialist should tune your piano. Also, the temperature and climate may be different in the new apartment. You might need to tune the instrument more often in the first year after the move.